Fight for $15? Try for $12? It depends on Sen. Joan Hartley. 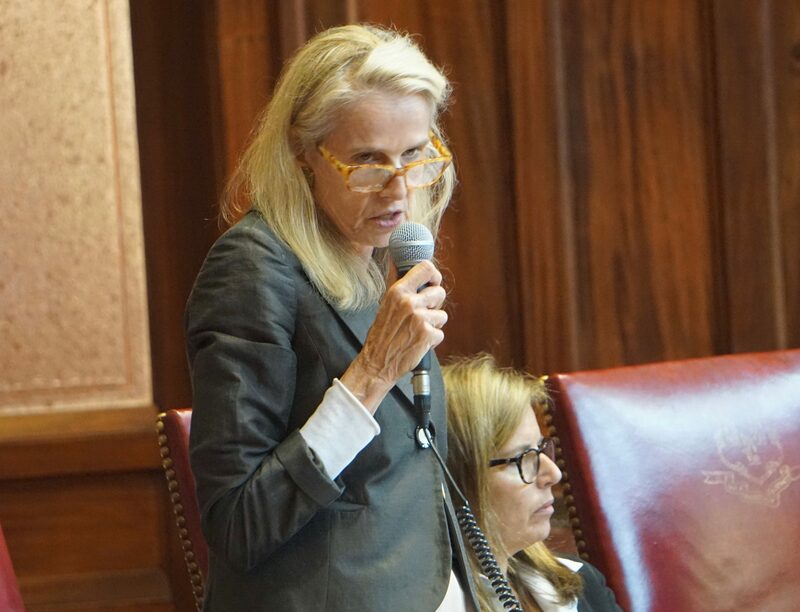 Sen. Joan Hartley speaks in support a of the Republican budget last year. The three most powerful men at the State Capitol — Gov. 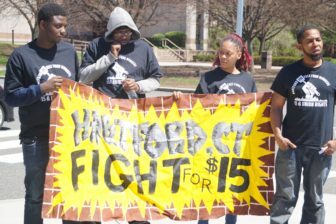 Dannel P. Malloy, House Speaker Joe Aresimowicz and Senate President Pro Tem Martin M. Looney — all want to raise Connecticut’s minimum wage, but that’s not enough. In a Senate evenly split for the past two years, the assumption is they need all 18 Democratic senators and the tie-breaking vote of the lieutenant governor. And that means doing business with Sen. Joan V. Hartley of Waterbury, the conservative Democrat with a long history of frustrating unions and her party’s liberal leaders over issues of taxation, spending, business regulations and, yes, the minimum wage. With the legislature’s constitutional adjournment deadline of midnight Wednesday fast approaching, Hartley is neither publicly opposed, nor in support. So, that is why Hartley was recently called on by Lori J. Pelletier, the president of the Connecticut AFL-CIO, whose endorsement is neither sought nor offered in Hartley’s campaigns. 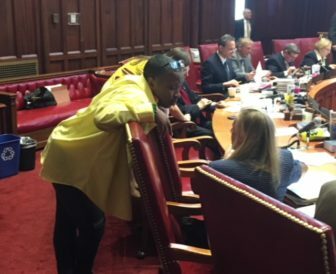 And it is why Rep. Robyn Porter, D-New Haven, co-chair of the Labor and Public Employees Committee, excused herself from a House session the other day to spend face time in the Senate with Hartley. Porter leaned over a high-backed, red leather chair, pitching to the seated Hartley the virtues of raising Connecticut’s minimum wage, which has been $10.10 since Jan. 1, 2017, under the terms of a state law passed in 2014 with the support of every Democrat in the state Senate, save one: Joan Hartley. Connecticut was the first state to pass a law gradually raising the minimum wage to $10.10, the goal set by President Obama for a Congress unwilling to raise a federal minimum wage from $7.25. It was a priority set by Malloy as he sought re-election to a second term in 2014, and is an election-year push for labor and progressives in 2018. The new national goal is $15. A bill before the Connecticut House would raise the hourly minimum wage on New Year’s Day in each of the next three years, to $12 in 2019, to $13.50 in 2020 and to $15 in 2021, an aggressive schedule that sponsors concede has no chance of passage. The bill’s backers already made a tactical retreat: keeping $15 as the goal, but stretching out the timeline for getting there to 2023 — still a year earlier than legislation proposed by Democrats elsewhere, including in Congress. With time running short, legislators are exploring seeking a more modest version, one that would go to $12 over two years. But Hartley said Monday no one has approached her about such a compromise. From the start this year, Malloy has said his goal is to ensure that minimum-wage workers don’t go another year without a raise, shying from making $15 a demand. Aresimowicz said he favors a raise, even if it falls short of $15. Looney says that a fallback might be necessary. Rep. Robyn Porter, left, talking to Sen. Joan Hartley about the minimum wage. And that is likely to be up to Hartley, who has not divulged her position to Looney or Porter (or CT Mirror), saying the bill is evolving. Pelletier, the labor leader, said she thinks Hartley is open to $15, depending on the timetable for getting there. “I never said that,” Hartley said. Hartley said she wants more data on how raising the minimum wage would affect the state budget and the economy. The state indirectly pays minimum-wage workers through state-funded, non-profit agencies that provide services ranging from child care to programs for the intellectually disabled. The Office of Fiscal Analysis estimated that the annual cost just to programs funded by the Department of Developmental Services could be $45 million. Hartley said she also wants to know what surrounding states are doing to ensure Connecticut is competitive. Rhode Island’s minimum wage is $10.10 and Massachusetts’ is $11, with no scheduled increases. New York’s — now ranging from $10.40 to $13, depending on geography and other factors — goes to $15 in New York City in 2018 and 2019, depending on workforce size. It will be $15 on Long Island and in Westchester by the end of 2021. Congress, for one. The federal minimum wage of $7.25 has not been changed since 2009, the first year of the Obama administration, a fact that drives and one of the reasons why the debate over a fair wage has shifted to state legislatures. Adjusted for inflation, the federal minimum wage lost a dollar in value since then. Connecticut is one of 29 states with a minimum above the federal standard. A Federal Reserve study found that nearly one-third of workers making less than $15 an hour in Connecticut are parents with children. Economists debate the impact of a higher minimum wage on the economy. Liberal economists argue that raises to the lowest-wage workers are an instant economic stimulus and also can reduce demand for social services. Conservatives warn that higher wages can mean fewer hours or even fewer jobs. A protest outside the Legislative Office Building last week. One of the more influential voices in Hartley’s district, the Waterbury Regional Chamber of Commerce, submitted public-hearing testimony opposing a minimum-wage increase as a blow to a still-fragile economic recovery. The Connecticut Business and Industry Association submitted testimony with identical language. Hartley is largely immune to pressure. With only a minor-party opponent, she was re-elected by nearly a 5-1 ratio in 2016 from a district that covers Waterbury, Naugatuck and Middlebury. She has twice succeeded Republicans to win open seats in the House and Senate. In the Republican landslide year of 1984, she won the seat vacated by John G. Rowland to run for Congress. Last fall, she was one of three Senate Democrats who sided with Republicans over the budget. A week ago, she reminded colleagues of her reluctance to impose new conditions on business. She and Sen. Gayle Slossberg, D-Milford, voted with all 18 Republican to defeat a bill that would have required certain employers to either stop making last-minute changes in employee schedules or pay them partial wages for canceled shifts.